1. Choose velvet ribbons that match the circumference and height of your vases. Trim each ribbon to fit around its vase with a 1-inch overlap. 2. 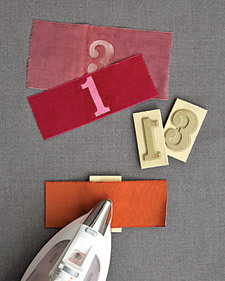 Place the stamp on an ironing board, and lay the center of the ribbon, fuzzy side down, over the number. 3. Set iron to medium heat, and spray the fabric very lightly with water. Using even pressure, iron back and forth slowly until velvet is uniformly and firmly crushed (our ironing time was about 10 seconds). 4. Trim one end of decorated velvet with pinking or scallop shears. Wrap the fabric around the vase, so pinked edge is uppermost. 5. Secure with double-sided tape, attaching each end of ribbon to vase, and pinked edge to ribbon beneath.